Documentary on the iconic Alabama recording studio. Muscle Shoals, a small town of 8000 people in Alabama, along the Tennessee River and home to FAME studios, which may just be one of the most important and fecund recording studios in music history. In Greg ‘Freddy’ Camalier’s fascinating story of FAME founder Rick Hall, we chart the evolution of Hall’s unique sound, aided and abetted by his house band, The Swampers, and the string of hits created by such diverse artists as Aretha Franklin, Jimmy Cliff, Lynyrd Skynyrd, The Rolling Stones and Percy Sledge. At the documentary's core is how in an area of such inflammable race relations, with the shadow of the Klan and segregation still in effect, did a group of mainly black Rhythm and Blues artists produce with the all white Rick Hall and The Swampers some of the richest, dirtiest and down right funkiest soul music of the sixties. Much is made of the environment in which the music has been created. The river, the history, the climate and struggle to live on the land that imbues the label's music with a certain mysticism (what in French wine terms would be called the terroir). It is these moments that are perhaps the weakest in the documentary. A mix of talking heads such as self appointed spokesman of the music industry, Bono, waxing lyrical about the environment and how the songs came out of the mud, and reconstructions of Native American folklore regarding the music spirit that lives in the river. An attempt to shoe horn Deaf/Blind activist Helen Keller into the narrative is a particular weak point. Strangely, the folk history it most clearly evokes is that of blues singer Robert Johnson, who allegedly sold his soul to the Devil at a crossroads to achieve success. Rick Hall has had so much success in his music career as to be remembered as one of the greats, but it is a life suffused with personal tragedy and loss to almost suggest a Faustian pact was made. The death of a sibling and his wife, the degeneration into prostitution of his mother and the death of his father, indirectly caused by his burgeoning success, would be accused as bad Southern Gothic if they were not so soul crushingly true. Camalier’s documentary follows the most conventional formats with its mixture of archival footage and talking heads of all the key players, however the stories are so fascinating that no gilding of the lily is really required. Like a good journalist, the film is at its most engaging when it sticks to the facts and keeps the metaphysical ramblings to a minimum. Finding success early with Arthur Alexander (now sadly deceased and his songs more known for being covered by The Stones and The Beatles). Rick Hall and his rhythm section were key to finding the earthy sound that was originally missing in Aretha Franklin’s early work and being pivotal in the development of artists such as Wilson Pickett and The Rolling Stones (Keith Richards seems particularly fond of the place, being banned from the US seems to be the only thing that stopped them recording more songs there). One anecdote regarding Pickett’s cover of 'Hey Jude' is particularly revealing of the racial tensions that existed outside the studio. On a break from lunch, Pickett and Gregg Allman were not allowed to come with them on the basis that a black guy eating with them would rile the locals, but a black guy and a hippy was liable to start a riot. For such a turbulent period of history, less time is given to the politics of the era, an approach that would have made this a richer document of the socioethnic geography of Fame Studios. It may be peace, love and harmony in the studio, with its racially diverse mix of musicians funking it up, but little is made about the appropriation of black music by white artists and white owned record labels. With such a rich wellspring of ideas and stories there is enough material for several documentaries; in this case Camalier wants you to hum the tunes and not pay attention to the lyrics. Like all good songs, this is about love, loss, success, fame, arguments and tragedy. Hall may at times seem like a difficult character, but with his personal history it is a miracle he is still standing on two legs. It ends on a grace note of reconciliation and second chances. If a music documentary is to succeed it should make you want to go out and buy the tunes. If this doesn’t get you wanting to raid the back catalogue, then my friend you have lost the funk. As Hall himself says at the end with regard to his method of music production “the imperfections are what give it the human element”. 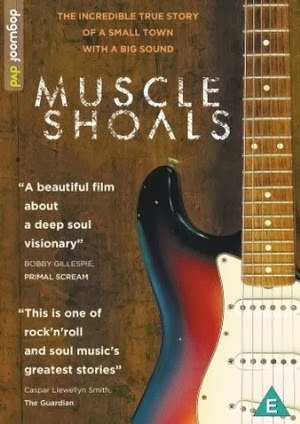 There may be imperfections here but by shining a light on a little piece of musical history in a small town in the Southern States of America he has made one of the most intriguing music documentaries of this decade. The disc is awash with extras, however the review copy was film only. A muscular set of features which alas did not end up on my shoals.